The firewood that you use can have great influence over how well your stove or fire performs and how enjoyable your experience will be. Quality, well seasoned firewood will help your wood stove or fireplace burn cleaner and more efficiently, while green or wet wood can cause smoking problems, odour problems and rapid creosote build up and possibly even dangerous chimney fires. Green wood is the name given to wood that has not been seasoned (not left out to dry). Green wood can have up to 45% plus of its weight as moisture. Trees felled in January when the tree is dormant will have less moisture content than those felled in May when the sap is rising. If you try to burn green wood, the heat produced by combustion must dry the wood before it will burn, using up a large percentage of the available energy in the process. This results in less heat delivered to your home, and literally gallons of water containing creosote deposited in your chimney. This is wood that has been felled the previous year or before and has been allowed to dry. Well seasoned firewood generally has a 15 – 20% moisture content. Well seasoned firewood is easier to light, produces more heat, and burns cleaner. The important thing to remember is that the water must be gone before the wood will burn. If your wood is cut a year in advance and properly stored, the sun and wind will do the job for free. Always buy your wood by volume e.g. the net, cubic metre bag. Never buy by weight you could be buying a lot of water. Green wood should be a lot cheaper than seasoned wood but you will need to store it in a place where the wind can get through it to aid in the drying process. There are a few things you can look for to see if the wood you intend to purchase is seasoned or not. Well seasoned firewood generally has darkened ends with cracks or splits visible, it is relatively lightweight, and makes a clear “clunk” when two pieces are beat together. Green wood on the other hand is very heavy, the ends look fresher, the bark will be hard to peel off and may be stringy and it tends to make a dull “thud” when struck. These clues can fool you however, and by far the best way to be sure you have good wood when you need it is to buy your wood the year before you intend to burn it and store it properly and test it with a moisture meter. The definition of the hard and soft/hardwood is quite involved and takes into account such things as the number of seeds per leaf stem and the veins on the leave. In general we get softwood from evergreen trees; pine, spruce and fir and we get hardwood from deciduous, broadleaf trees; oak, elm, cherry, ash and balsa to name a few. You will get the same calorific value from a kilo of soft wood as you will from a kilo of hard wood. The difference is that hard wood is denser than soft wood so you will get more calorific value from the same volume of log from a hard wood than a soft wood. Wet wood = low calorific value as the heat energy is used to dry the log. Even well seasoned firewood can be ruined by bad storage. Exposed to constant rain or covered in snow, wood will reabsorb large amounts of water, making it unfit to burn and causing it to rot before it can be used. Wood should be stored off the ground if possible and protected from excess moisture when weather threatens. Saw, split and store the wood to the size that is ready for use; this ensures rapid drying because smaller pieces of wood dry better than larger, uncut logs. The ideal situation is a wood shed, where there is a roof but open or loose sides for plenty of air circulation to promote drying. Next best would be to keep the wood pile in a sunny and draughty location and cover it on rainy or snowy days, being sure to remove the covering during fair weather to allow air movement and to avoid trapping ground moisture under the covering. The moisture still remaining in the wood (approx. 15 – 20%) is evaporated. This takes place at temperatures of approx 100°C. 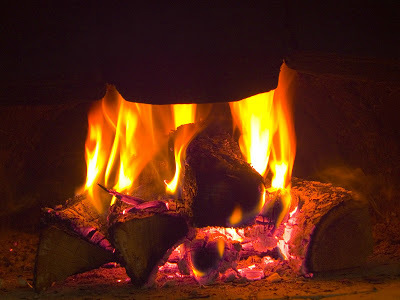 For the evaporation to occur, the wood must be supplied with heat during the warming up phase; this is achieved by using the kindling as detailed above. At temperatures of between 100°C and 150°C, the contents of the wood start (slowly at first) to disintegrate and gasify and the wood begins its thermal decomposition. At temperatures above 150°C, the gas development increases strongly. The proportion of volatile components makes up around 80% of the wood substance. At a temperature of about 225°C (ignition temperature), the actual combustion begins with the ignition of the resulting gases and the release of heat. There must be an adequate supply of oxygen available for this purpose. The peak of the combustion process is reached at approx. 300°C. The reaction process is now so rapid that the largest amount of heat is released at this point; flames can reach temperatures of up to 1100°C. Glowing charcoal embers remain after the volatile components have been burned off. These burn slowly, almost without flames, at a temperature of approx. 800°C. Crucial to a clean and efficient combustion process is a complete (as possible) chemical reaction of the wood gases with the oxygen in the combustion air. With newer stoves, the combustion air is pre-heated and guided into the fire box via wide air inlet openings, enabling a good and thorough mixing of the gases with the air. An important variable in any combustion phase is the amount of combustion air. Not enough air leads to an oxygen deficiency and incomplete combustion, while too much air reduces the fire box temperature and thus the efficiency. Incomplete combustion can generate air pollutants such as dust, carbon monoxide and hydrocarbons. If you try to burn green wood, the heat produced by combustion must dry the wood before it will burn, using up a large percentage of the available energy in the process. This results in less heat delivered to your home, and a great deal of moisture in the form of creosote deposited in your chimney. Wet wood burns slowly, with little heat, the chimney flue does not get a chance to warm up. There is little draw (air moving up the chimney) which doesn’t help the combustion, and the flue remains a cold surface on which the creosote condenses. Dry wood will burn hot – heating up the flue, creating a fast draw, and shooting the smaller amount of vapours out of the chimney before they get a chance to condense.